The last couple of days have pretty much seen dry weather dominate Tamil Nadu mostly. Till the Vardah remnant was around Lakshadweep parts of the state was receiving some rains in particular around the Nilgiris & Western Region of Tamil Nadu along with one or two areas in Coastal Tamil Nadu. Once it moved further to the west on its way towards Somalia the rains slowed down. Currently the remnants of Vardah is off the coast of Somalia as a Well Marked Low. In the meanwhile as we had indicated a couple of days back the Trough of Low Pressure now lies off the coast of Sri Lanka. It has not shown any signs of developing into a stronger tropical disturbance. 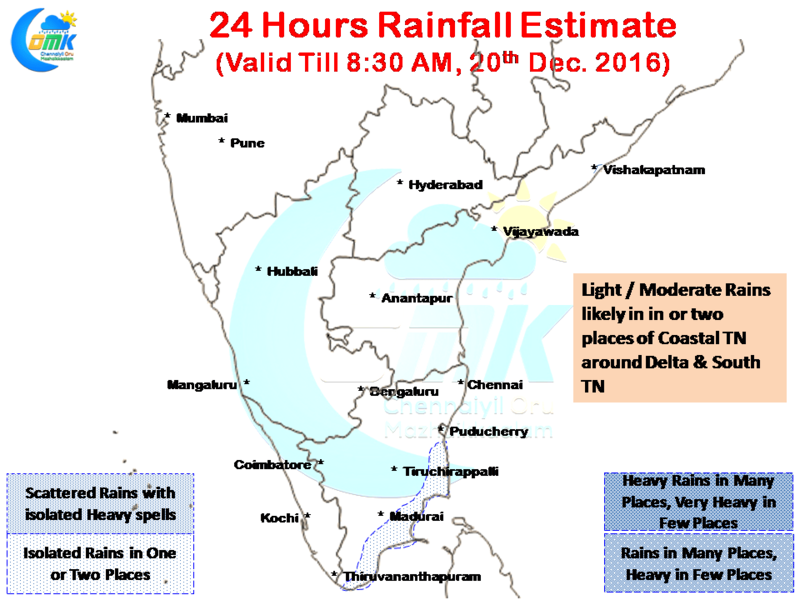 In all probability it could fade away in a day or two after providing for some rains over parts of Sri Lanka & Coastal Tamil Nadu. Today under the influence of the nearby Trough of Low Pressure and some moisture brought in by the Easterlies we could see some light to moderate rains over isolated parts of Coastal Tamil Nadu. The rains are likely to be seen more to the South of Pondicherry along the delta region and between Ramanathapuram and Nagappattinam stretch. One or two places could get spells of moderate / heavy rains at times during the night / early morning. But overall these are unlikely to develop into widespread rains across the state as things stand. Chennai could be see a fair winter day with day time temperature in the region of around 30 / 31°C while night time temperatures could dip close to 20 in the suburbs of West & North under the influence of a more clearer sky.